The Global Volcanism Program has no activity reports for Zuni-Bandera. The Global Volcanism Program has no Weekly Reports available for Zuni-Bandera. The Global Volcanism Program has no Bulletin Reports available for Zuni-Bandera. 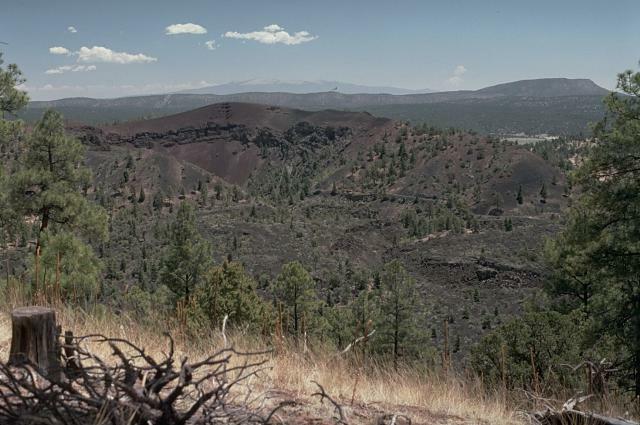 The Zuni-Bandera volcanic field covers an area of 2460 km2 along the Jemez lineament west of the Rio Grande Rift. An older volcanic episode, mostly from vents along the Chain of Craters, took place about 3.8-3.7 million years ago (Ma); the younger episode began about 1.7 Ma and has continued until the present, forming an extensive area of young lava flows known as El Malpais. The youngest lava flow, the McCartys flow, traveled 60 km NE, fed by lava tubes up to 29 km long. The McCartys flow was recorded in Indian legends and was thought to have been erupted about 1000 years ago, but radiocarbon dating indicates an age of about 3000 years Before Present. The only other dated flow of Holocene age originated from Bandera Crater during the early Holocene about 9000-10,000 radiocarbon years ago. An earlier flow, the massive Pleistocene Fence Lake lava flow, traveled as far as 90 km W.
Dunbar N W, Phillips F M, 2004. Cosmogenic 36Cl ages of lava flows in the Zuni-Bandera volcanic field, north-central New Mexico, U.S.A.. New Mex Bur Geol Geophys Bull, 160: 309-317. Laughlin A W, Brookins D G, Causey J D, 1972. Late Cenozoic basalts from the Bandera lava field, Valencia County, New Mexico. Geol Soc Amer Bull, 83: 1543-1552. Laughlin A W, Poths J, Healey H A, Reneau S, WoldeGabriel G, 1994. Dating of Quaternary basalts using the cosmogenic 3He and 14C methods with implications for excess 40Ar. Geology, 22: 135-138. Lipman P W, Moench R H, 1972. Basalts of the Mount Taylor volcanic field, New Mexico. Geol Soc Amer Bull, 83: 1335-1344. Maxwell C H, 1982. El Malpais. New Mexico Geol Soc Guidebook, 33rd Field Conf, p 299-301. Maxwell C H, 1986. Geologic map of El Malpais lava field and surrounding areas, Cibola County, New Mexico. U S Geol Surv Map, I-1595. Nichols R L, 1946. McCartys basalt flow, Valencia County, New Mexico. Geol Soc Amer Bull, 57: 1049-1086. There is no Deformation History data available for Zuni-Bandera. There is no Emissions History data available for Zuni-Bandera. Bandera Crater in the center is part of the Zuni-Bandera lava field that covers a 2460 sq km area of central New Mexico. The lava field contains 74 vents that erupted voluminous lava flows, including the 90-km-long Fence Lake flow and the youngest flow of the lava field, the 3000-year-old McCartys lava flow. The McCartys flow traveled 60 km to the north, extending to the base of the Mount Taylor range, the peak in the distance. 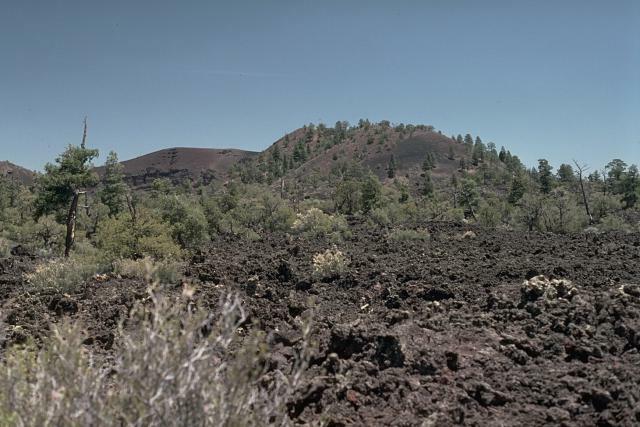 Bandera Crater, one of the youngest features of the Zuni-Bandera lava field, is a breached cinder cone that fed a lava flow dated about 9000 BCE. The Bandera lava flow forms part of El Malpais (Spanish for "badlands"), the largely unvegetated, youngest Quaternary basaltic lava flows that cover a broad area south of Grants, New Mexico. There are no samples for Zuni-Bandera in the Smithsonian's NMNH Department of Mineral Sciences Rock and Ore collection. Large Eruptions of Zuni-Bandera Information about large Quaternary eruptions (VEI >= 4) is cataloged in the Large Magnitude Explosive Volcanic Eruptions (LaMEVE) database of the Volcano Global Risk Identification and Analysis Project (VOGRIPA).